Another Easter holiday is just around the corner and preparations are well under way. Head over to the nearest farm to secure enough eggs that you would later decorate and pretty up the Easter table. Make sure to pay close attention to the decoration process seeing as the community will reward the best looking Easter Eggs with some amazing prizes, and winning one of these would definitely make the festivities even more enjoyable. 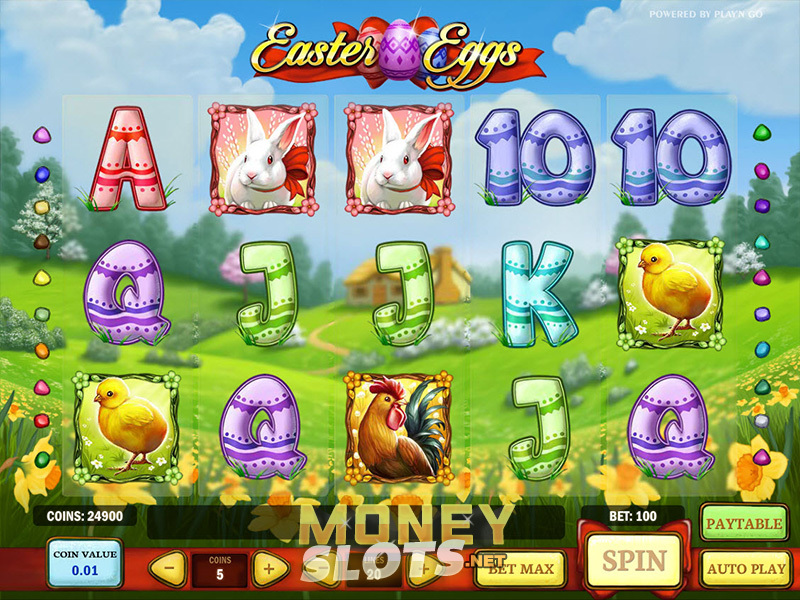 Easter Eggs was rolled out by Play'n Go ahead of the 2015 Easter and the game proved instant success among casino gamers. Featuring adorable game symbols and soothing background image, yet housing two impressive bonus rounds and few more extra features, the five reel, twenty line video slot will keep you entertained for hours on end. The action takes place at a farm located in the middle of a stunning meadow, with farmyard animals roosters, sheep, rabbits and chicken running around and enjoying the nature. Decorated playing cards Ace, King, Queen, Jack and Ten populate the reels as well, in addition to one of the best selections of Easter Eggs you will have ever seen. The feature icons also become animated as they form winning combinations. Easter Eggs is played at up to twenty paylines, which can be selected using + and -, whereas coin value ranges from $0.01 to $1. Players have the option to wager up to five coins per single line, with Bet Max and Auto Play supported. Pressing space on your keyboard will also start the reels. Easter Egg is Wild and while it substitutes for all icons apart from Bonus and Scatter, it also doubles any payout in the process. Get three or more Scatter symbols anywhere on the game screen and you will get a chance to choose between 5 free spins at x6 multiplier, 10 free spins at x3 multiplier or 15 free spins at x2 multiplier. Three Bonus icons in any position activate the Bonus game where you get to pick eggs for an opportunity to win up to 500x total bet. Obtain two, three, four or five Scatters anywhere and you will receive a payout equal to 2x, 3x, 15x and 150x total bet. You can also use Gamble feature after each winning spin to double or quadruple your line wins. Easter Eggs is another Play'n Go title that was simultaneously released on desktop and mobile, and the only major difference between the two versions is the fact that game options panel have been removed from the main screen in the HTML5 variant. Nevertheless, important player options can be easily accessed via Menu, whereas excellent visuals and quality gameplay ensure that you will have a great time while playing the feature-rich video slot on your tablet and smartphone.